International newspaper Insider has just selected 35 of the most beautiful natural wonders in the world, Ha Long Bay is included in this list. Ha Long Bay has been newspaper Insider unsparing the praiseby for this rare natural beauty: "Natural beauty makes Ha Long Bay one of Vietnam's number one tourist destinations. The bay is also a UNESCO World Heritage Site. 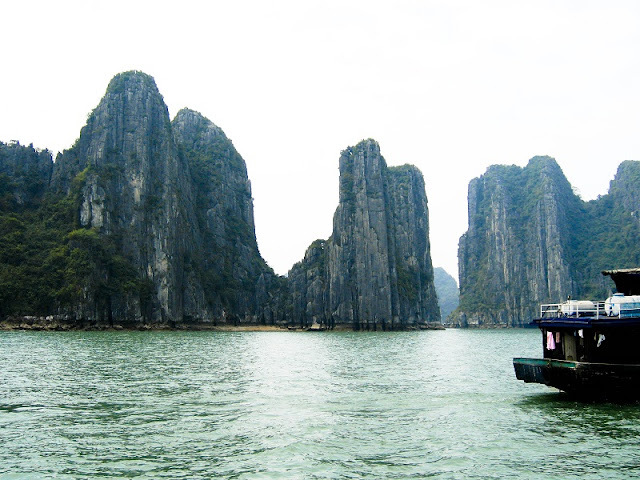 The best way to see the incredible limestone towers of Ha Long is by boat. In fact, many tourists stayed overnight on Halong Bay cruise. " How far is it from Hanoi to Halong Bay? The distance from Hanoi to Halong Bay is around 180km and generally takes around 3 1/2 to 4 hours each way, depending on traffic. On the way, you’ll have a half-time/pee break at a souvenir store selling all kinds of products directly aimed at tourists. You’re under no obligation to buy anything so feel free to breeze on through, use the toilet and get back on the bus. What is there to do once you’re there? Okay, so you may be thinking, ‘What am I going to do? Just sit on a boat and stare out into the distance for three days?’ You’ll be pleased to know there are loads of activities to enjoy while you’re out there, what they are, specifically, will depend on the cruise you end up booking. On the cruises I’ve done activities included kayaking, visiting Thien Canh Son Cave, cooking classes, tai chi, karaoke, live music, Vung Vieng Fishing Village, day trips on a smaller boat to hidden coves for swimming, stand-up paddle boarding and visits to Teapot Island or Monkey Island.